Satyanarayana Puja is held in most of the Hindu households in India. This Puja is often held to seek the blessings of Lord Vishnu which in turn is believed to bring happiness, success and good health into the family. Satya Narayan is one of the many forms of Lord Vishnu and this form is believed to be the embodiment of truth. With special prayers, the Satyanarayan Puja in Chennai, Mumbai, Bangalore and all major cities of India can be held on any day of the year. However, most of the families hold this special Puja on auspicious days like a Full Moon Day. As a part of the celebrations of this day, special chapters from the Holy Book are read aloud by children during the Puja. As you hold Satyanarayan Puja at your house, most of you would be planning to invite your closest friends and family to it. The best way out is to use free online Satyanarayana Puja invitations from Yoovite.Com. With such free Indian online invitation tools, you can easily send out all your invitations in one click and your guests can RSVP as soon as they see the card. Printing out the invitations will involve a lot of money as well your precious time. The decorations for Satyanarayan Puja are mainly with flowers. Devotees clean the whole house and the platform where the Puja is to be held is mainly adorned with flowers. Deities and colorful pictures of Lord Vishnu are placed on the platform. The devotees make it a point to wear clean and new clothes on this day. A strictly vegetarian diet is followed on the day of the Satyanarayan Puja. The main food for the Satyananaryan Puja includes all kinds of fruits and Indian vegetarian curries with rice are served on this day. The food is first placed on the altar during the Puja and then this is distributed among all who are attending the Puja. Satyanarayana Puja is celebrated giving importance to the onset of uttrayana punyakalam, which is believed to be the time when the Sun starts its journey to the northern hemisphere. According to the Hindu scriptures, this time of the year is known as Makara Rasi. The celebrations for Satyanarayan Puja begin with the devotees taking a bath in holy waters. The special puja for Sree Satya Narayan held on this day is believed to bring abundance of wealth and health to all forms of life on the earth. The devotees worship Sree Satya Narayan on this day and the Puja can be held at any time of the day. The full moon night of Sankranthi is said to be the most auspicious day for holding this Puja. On the day of the Puja, devotees have to maintain a fast after the morning bath. The day begins with special prayers and is most often attended by relatives, friends and neighbors of the person holding the Puja. The puja is held on a platform and this place is decorated with idols of the Lord well accessorized with kum kum and turmeric powder. The platform is decorated with burning camphor, beetle leaves and nuts, coconuts, almonds and flowers. The puja is held to appease the Gods so that they bless the devotees with prosperity and peace. Satyanarayana Puja is celebrated in great pomp and splendor in most of the major cities of India and in any place in the world there are Hindu devotees. 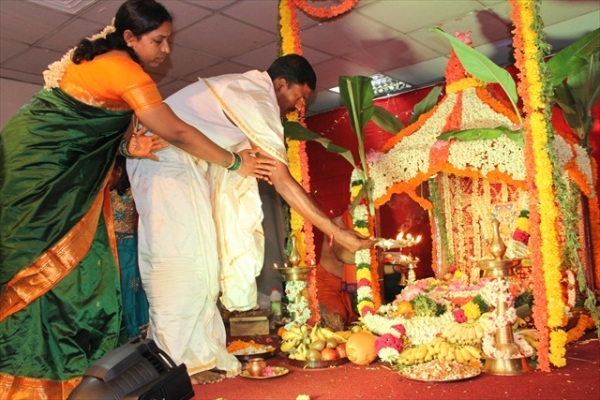 Satyanarayana Puja celebrations in Chennai, Bangalore, Delhi, Mumbai and Kolkatta are held to bridge the gap between visiting relatives and also to have fun with the family. Indians celebrate Satyanarayan Puja in the start of the spring season, no matter in what part of the world they live. Wearing new clothes during the Puja is an implication of new promises and hopes. Several mouth-watering delicious sweets like malpua, gujiya and poli are distributed after the Puja. The evening after the Puja is used to convey wishes to relatives and friends. As in all Indian festivals, there is plenty of dancing involved in the festivities of Satyanaryan Puja celebrations in Chennai, Mumbai, Bangalore and other parts of the country. To invite all your friends and relatives for the Satyanaryan Puja, you can now use online invitation cards at Yoovite.Com. We have a huge range of cards for all Indian occasions and it is really simple to use our site.